Unquestionably Mom. Undeniably Committed. Dangerously Surrendered. The journey of hosting her child's life blood as God formed him from a thought to a miracle within her womb. The flood of emotions that accompanied the very moment her physical pain of birthing yielded the most personal introduction to his life, from her life. The unmistakable God-ordained assignment of "blessed" when she cradled his tiny body to her bosom for the first time. That first smile, it turned into a short cackle, then flowed a laugh so sincere and mighty it had her thinking things might be survivable after all. The first time he fell asleep mid-chew, sitting up in his high chair. Dozens, maybe hundreds of crayon Picasso's, memorialized on every inch of the refrigerator (or anything a magnet would stick to). The honor of first-name recognition as bestowed on her by remarkable pediatricians and their staffs. Intense perseverance, that of a master mechanic, as she navigated car seat buckles, child-proof locks, bouncy swing failures, all-the-while maintaining her full-time diaper changer/phone operator/caretaker and lovely lady game face. He rolled over, he crawled, he walked, he talked. Oh, my! How would she ever work up enough courage to walk him into pre-K that first time, letting go, letting God, seeing him turn away from her to his teacher and continue on out of sight, "Mommy will see you again before you know it." Neither did we know the timing of our arrival on this earth, nor do we know in advance when God will call us to Himself from this earth. It is for God to know and for us to run the race. To run the race without abandon, for His race is the point of life. The race, our God-ordained life's journey, planned to take us down a narrow path, the quickest route to Him. Oh, but the twist and turns we opt to take along the way, away from Him, for ourselves; yet our forgiving God allows us to return back to the race because He adores us and He alone can restore our faith in Him. Along the way, a Decision of providence is made, with the utmost care and consideration involved, the culmination of divine prerogative from the highest Authority, a decision that has all of Heaven rejoicing, for he is being called Home. The decision, though, not one she would ever wish for but one she must endure by faith, relying on His grace, for the grief of losing him will be great, but blessed are those who mourn for they will be comforted. The pain she experienced in birthing him was nothing compared to the emptiness that continues when she now looks for him, even though she knows he is not there. But, she knows where he is and that she will see him again. In the moment of his physical death, the hand of his Savior was there for him. Time stopped for him right then. Death stopped, pain stopped, degeneration stopped, medicine stopped, fear stopped, anxiety stopped, depression stopped, agitation stopped..it all stopped. Absent from the body is present with the Lord! With seamless transition, with everything made new and immaculate, instant restoration for him - and eternity began. So did great celebrations of the untold many in His Kingdom, all wanting to meet her boy, to rejoice in his arrival. Finally. Rest for him, healing, newness, all burden lifted - oneness with the Lord. A Promise kept. The Lord designed him, gave him life from her through the umbilical cord. The Lord designed her. The Lord hears her every thought in advance, gently wipes each tear that washes her eyes and divinely makes certain the Holy Spirit maintains the umbilical connection between her and her boy, through memories, dreams, the promises of His Word, close community with believers, her husband, her family, her extended family. Rejoice! And again I say rejoice! Have no fear. Though she may wash her eyes with tears of loss, she should look forward. She should set her eyes upon the future. Continue the race for Him. The past cannot change, but the future, the future is bright with promise, promise that you will see your boy again. Amen. 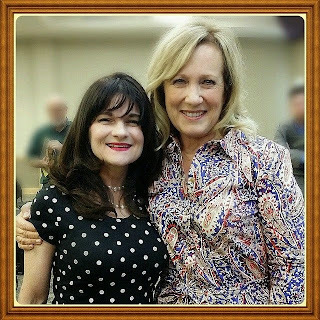 Picture (May 2015): Julie Brooks with Kay Warren. Both moms. Both sold-out believers in Jesus the Christ. Both lost sons to suicide. Both with hearts bound by sorrow. Both have dangerously surrendered to God's plans for them. Both are Warriorettes in the Lord's Mental Health Army. No regrets. No turning back. Education, love, community and the local Church are the focus. Committed to running the race.